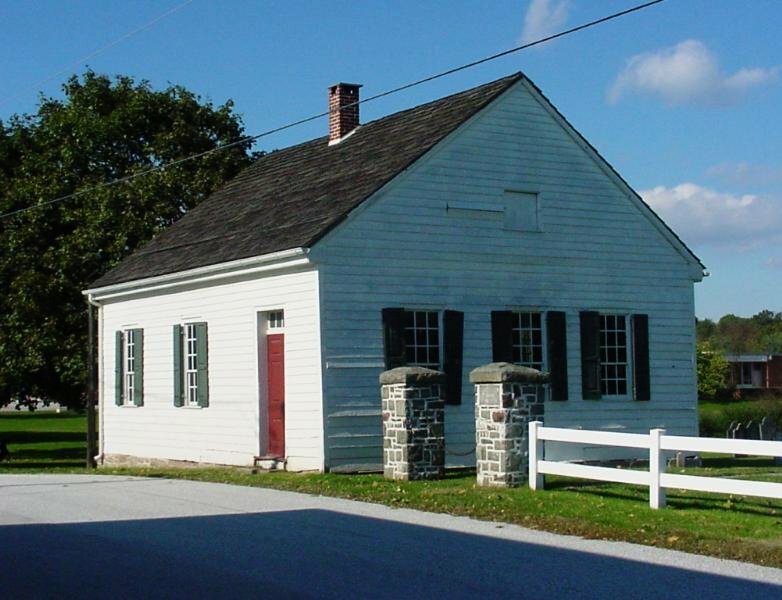 The best evidence of the construction date of the Church Schoolhouse is found in an article written by Professor J. Curtis Hildebrand, a teacher and principal at the Select School in the 1870's. He mentioned that the Berlin Improvement Society "occupies a schoolroom, owned by the Lutheran and Reformed churches, built over a hundred years ago and yet in good condition". This would date the building to the 1770's or earlier. This wonderful eighteenth century log building has been a center for learning for much of its history. Several German church schools were here at various times until 1839. From 1836 to 1910 it also became the meeting place of the Berlin Improvement Society whose members were dedicated to becoming more knowledgeable. The Society set up a lending library of over 600 volumes in the huge, original walnut cupboard (built for $22.00) along the west wall. The Berlin Beneficial Society, chartered in 1844, met here as well, and provided comfort to those in need of help due to illness or death. Starting in 1870, the Select School drew students from as far as Thomasville, Arendtsville, and New Oxford to board with town families and learn from instructors such as Professor J. Curtis Hildebrand. There is a pot-bellied stove providing the only heat even today. No plumbing or electricity exists. Windows and hanging oil lamps give the only light. Out houses would have been used during the buildings entire active history. Student desks are probably from the early 1900's and a stool with a dunce hat is in the front corner- a typical punishment in the 19th century and later. Students wrote on individual slates and learned to write with a quill dipped in ink. Coats were hung on the wall pegs: there were no closets or lockers. The building was closed for public school purposes in 1930. The East Berlin Lions began work to preserve the school in the early 1960's. Since 1983 the East Berlin Historical Preservation Society has been responsible for restoration and maintenance, and used the building as part of its Education Program.